If you are a parent you are probably all in the same boat as me. Back to school shopping and prepping is under way! For me in My Three C’s land it also means clearing out summer fodder that is cluttering the house. 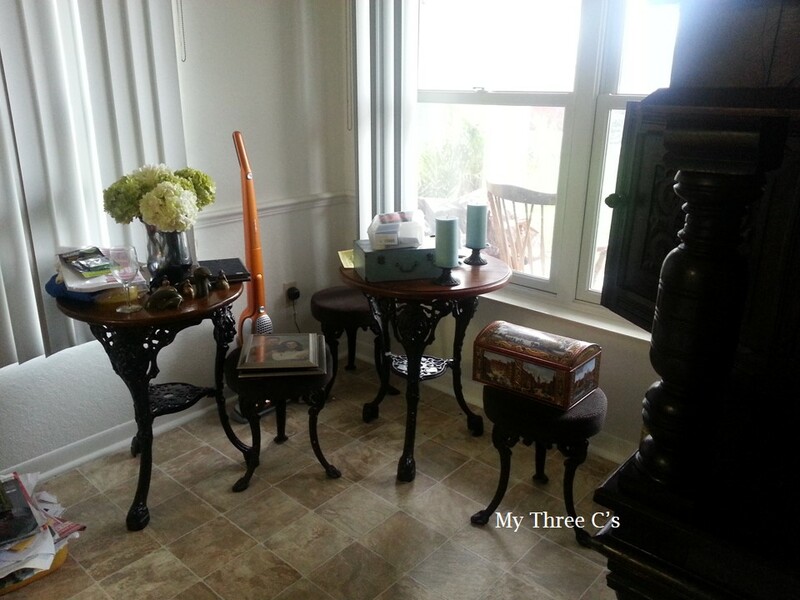 I originally planned on showcasing a few of my downstairs rooms, but with being a chauffeur, savings and loans and personal shopper to C #1 and #2, I have had to put rearranging and buying/making fun new décor on hold. That is until they are back with the class on Wednesday. 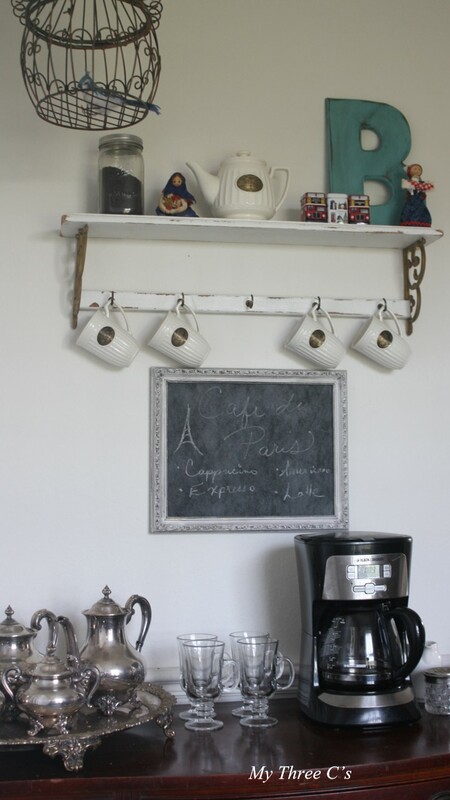 :D So to give you a taste at what I’ve been up to and to share a few more pictures that are not on Facebook, let me give you a look at my newly rearranged and quaint Breakfast Nook and Coffee Bar. Here is the after. I moved my antique Barley Twist Table and Chairs into the space and incorporated a garage sale Duncan Phyfe Style Desk into a Coffee Bar. 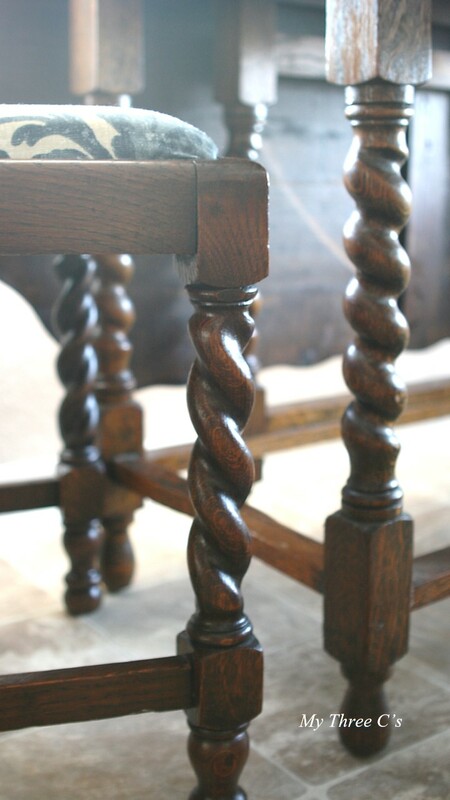 Here is a close up of the Barley Twists on the table and chairs. I bought this while we were stationed in England. I reupholstered the cushions a few years ago and am still loving the pattern. 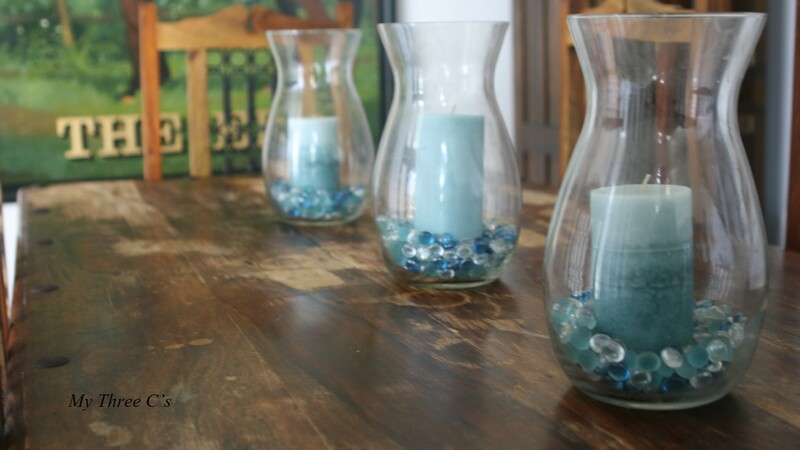 In order to save money, I used things I already had laying around the house and repurposed them in this area. 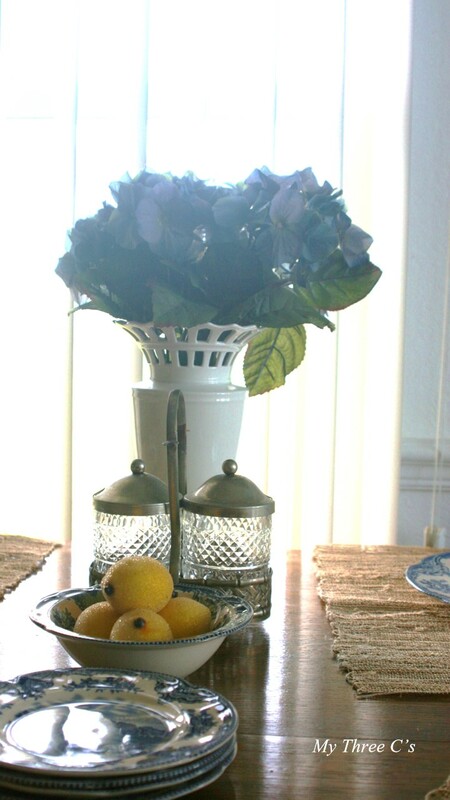 I love hydrangeas at the moment so you can find a few bunches here and there in my home. 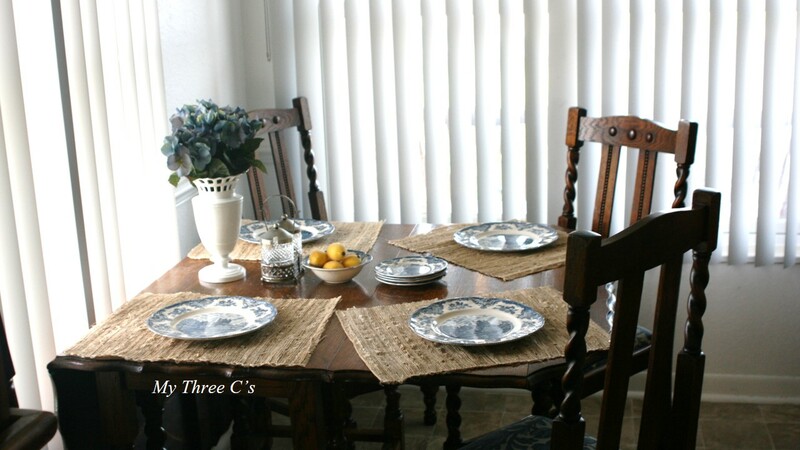 Another way I saved money was to repurpose an older burlap table runner I wasn't using anymore and cutting it into four equal pieces. BOOM! New place mats! You may also be surprised that the china was a recent Goodwill find. I think the old blue and white castle landscape china really compliment the theme of the room. 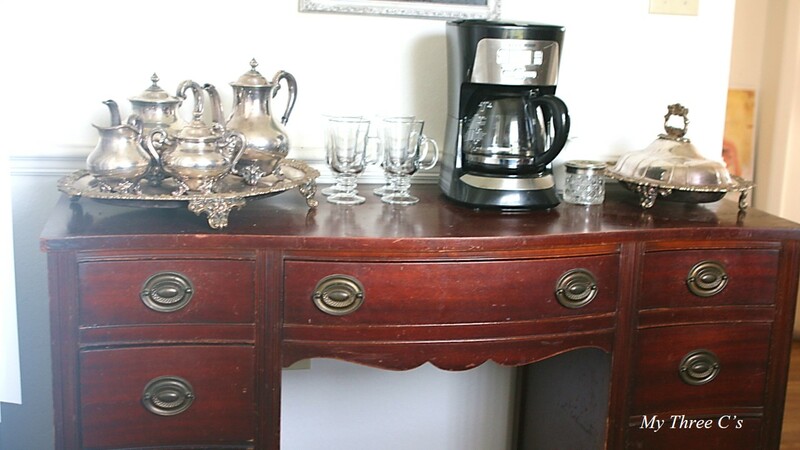 Here is a view of the coffee bar. 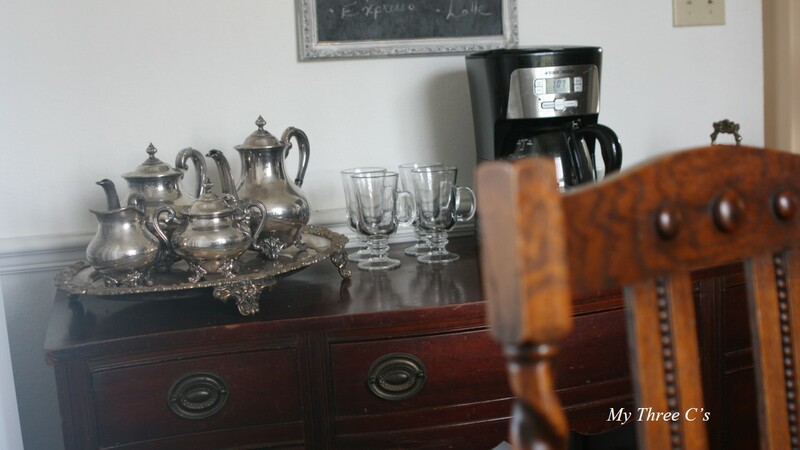 Fully functional and ready for coffee in the morning or afternoon tea! The Tea Service is also from England and is not the Silver Plated variety you find here in the US. This baby (along with the matching buffet server) is the real deal and one of my most treasured finds. The Ceramic Tea set was purchased in Papa Hungary as well as the little lady figurines. 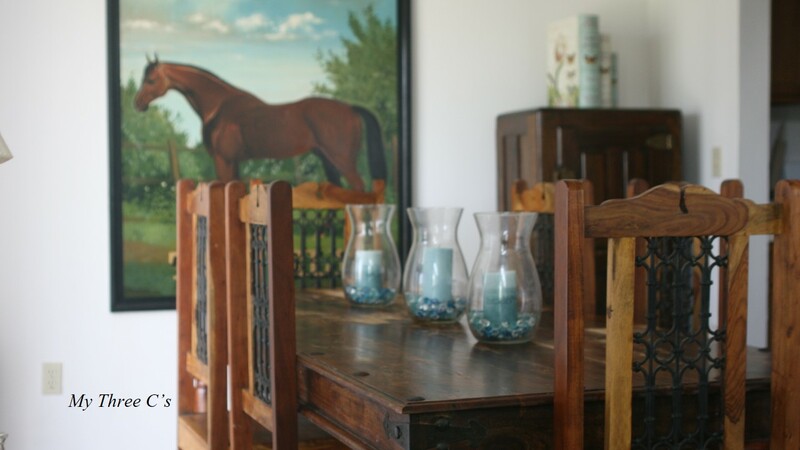 I love that everything is in such close proximity and with a little movement of my serving ware, I can go from coffee bar to Hors d'oeuvre station and Wine Bar for easy entertaining. 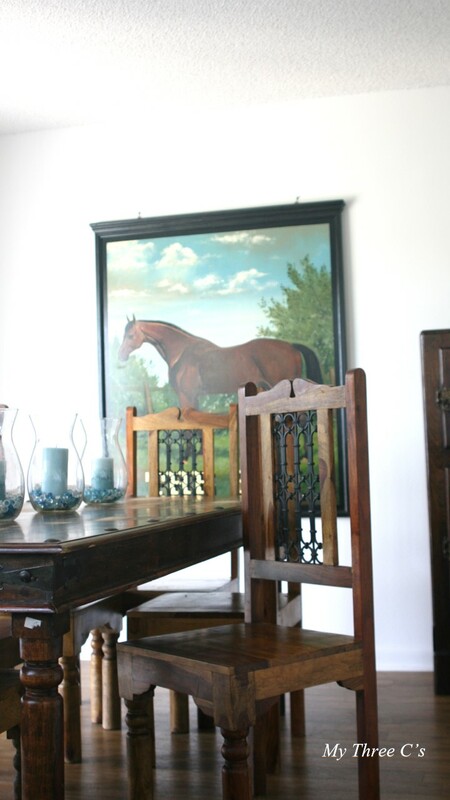 I would like to share some before pictures of my dining room table. I bought this in England as well. It is not an antique but it is handmade. I am getting tired of the all dark wood palate and want to paint something for myself for a change. 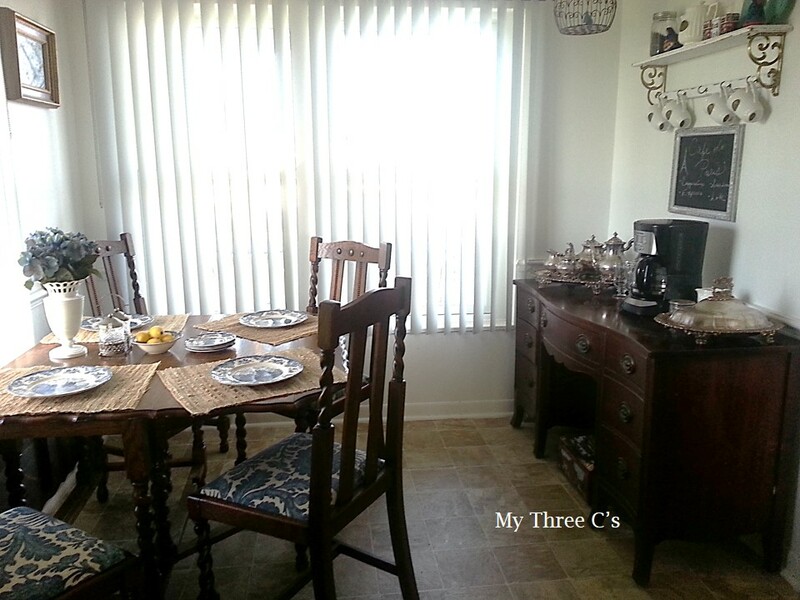 I have very little My Three C originals in my home because they all go on to be with other families. I think I deserve it. lol! The top was treated with wax and has seen far to much wear for my taste. I know some would love me to leave this "as is", but I cant live with the water rings ANY LONGER! Stay tuned for the after on this project. Until Next Time, I wish you all the very best! Happy Monday!